A concertina is a sort of retarded accordion -- if one can imagine anything less intellectually stimulating than an accordion. Historically, the concertina was favored by traveling Irish musicians. It is unclear whether this was because the concertina is easily transported, or because, having taken up the instrument, the musicians themselves were forced to keep moving by angry mobs of outraged listeners. Possibly the latter applies, since concertina locomotion is a style of movement also used in tight spots by limbless terrestrial vertebrates. As practiced by snakes, for example, concertina movement involves curving the back of the body so that it presses outward against both walls of a burrow or any other narrow channel. The snake extends the anterior part of the body. The anterior is then folded so that it presses against the sides, and the posterior is hauled up. In dorsal view it looks as if the body fold stays in one position and the snake moves through it. See limbless mobile robots. Progress is relatively slow and energetically expensive, but it works well enough to allow snakes to climb trees (even those which are likewise limbless). The snake-like terrestrial caecilians are perfectly capable of this kind of locomotion, and it is part of their normal behavioral repertoire. However, they are also highly specialized for a different style of concertina locomotion: internal concertina movement. This trait allows caecilians to move through spaces so narrow that there is no room for maneuver at all. Rather than folding the body against the walls of a channel, caecilians seem to laterally expand a section of the body wall so that it is fixed against the perimeter, while stretching forward with more anterior sections. Fig. 1. Figure 1 should not be taken too seriously. Not only is it constrained by my customary lack of artistic talent, but it suggests, wrongly, that the compressed section is limited to a few body segments. In fact, the whole post-cranial body may initially be compressed, with the anterior end then moving forward like a compressed spring. However, such an image is also misleading, since it suggests an elastic recoil, which does not seem to occur. This series of motions, however they may be portrayed in mechanical detail, is routine behavior for an earthworm (the caecilian's favorite prey), but just how does a vertebrate manage the trick? 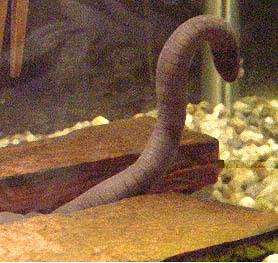 Caecilians are unique in that their vertebral column is very loosely attached to the body wall. Thus, the spine can move independently of the skin for quite remarkable distances. But how does this translate into translation, so to speak, of the entire body? Much of the job of unraveling this knot has fallen to Dr. James C. O'Reilly. O'Reilly was, until 2001, a Darwin post-doctoral fellow in Prof. Elizabeth Brainerd's Biomechanics Lab at the University of Massachusetts -- the same people who brought us Nat Kley, whose work is discussed at Scolecophidia . Oddly enough, O'Reilly has proposed two quite different mechanisms for this behavior. These are not inconsistent explanations, but it is not yet clear how they work together. 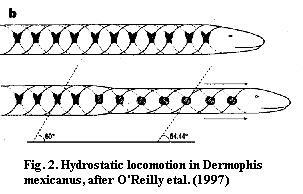 In Summers & O'Reilly (1997), Dr. Adam Summers (who was then O'Reilly's predecessor as Darwin Fellow in Prof. Brainerd's lab) and O'Reilly injected Dermophis mexicanus with stationary lead markers and monitored its movement in narrow channels with X-ray cinematography. They concluded that Dermophis was engaged in more or less routine concertina movement, but inside its own skin. 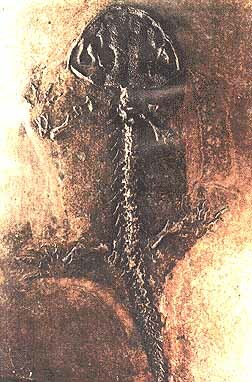 That is, the vertebral column was deformed in a series of S-curves within the body cavity, and the caecilian was pushing its head forward, even against considerable resistance, using the force of the vertebrae against the body wall which was, in turn, fixed against the side of the channel. This sounds reasonable, at least for this rather weird and unreasonable organism, but is it the whole story? For good and sufficient experimental reasons, O'Reilly & Summers fixed the channel width at 120% of body width. Yet Dermophis is capable of concertina movement in channels of 100% body width -- with no room to maneuver at all. It is not intuitively obvious that the described form of internal concertina movement would work as well in such minimum width channels. Thus, in a later paper (which actually came off the presses about the same time due to the usual vagaries of publication delay) O'Reilly et al. (1997) proposed a rather different, hydrostatic mechanism. The hydrostatic mechanism is based on the detailed anatomy of the body wall. It appears that Dermophis has two sets of helical fibers of opposite chirality (a left handed and a right handed helix) embedded in the body wall. The two sets of fibers are linked with the vertically oriented transversus muscles and paralleled by the obliquus muscles. When the muscles contract, the angle between the two sets of fibers is reduced and the body becomes a rigid cylinder. Fig. 2. This mechanism not only moves the head forward, but creates powerful forces for digging through compacted earth. In fact, the two modes: mechanical and hydrostatic, probably work together. The hydrostatic device is powerful. 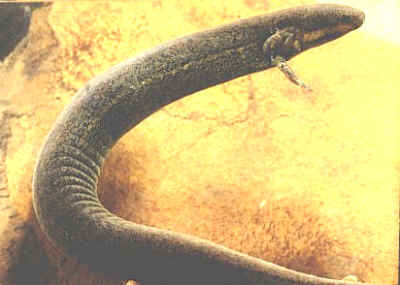 It explains how the caecilian elongates and generates digging forces -- but it doesn't really explain net forward motion. The proportional extension of the body should be approximately equal to ratio of the cosines of the angles, or 16%. Assuming half the body is extended, and that all of the gain is maintained on relaxation, the center of mass moves a rousing 4% of body length. O'Reilly et al. measure the cycle time as about 4 minutes in their experimental system. So this is not exactly orbital velocity. In fact (if my math has not failed me somewhere) it implies a speed of one body length in a bit over an hour and a half. As the authors explain, the force is generated by the body wall, not by the pressurized body fluids. The rigidity and thrust are inherent properties of the helix-antihelix framework, if I understand the argument correctly (and I may not). Back. Lissamphibia: frogs, caecilians, newts, salamanders. Microsauria: Lysorophia + * : Gymnophiona + (Urodela + Anura). very open skull with braincase as major support in Anura & Urodela; distinctive m. levator bulbi; green visual rods; plectrum-operculum complex (analogous to auditory stapes); papilla amphibiorum for hearing; pedicellate teeth, bicuspid or multicuspid, with basal uncalcified zones; spool-shaped vertebrae; unified centrum; buccal pump ventilation (lungs for oxygen uptake only, dump CO2 through skin); glandular skin with respiratory exchange; mucous glands; scales absent; most have aquatic larvae with external gills. Notes: Possible sister of Lysorophia. Carroll (1988) argues convincingly that this group is within Lepospondyli. However he may no longer hold this position as to urodeles and anurans. Links: Animal Diversity Web: Class Lissamphibia; superordo Lissamphibia Dutch); Living Amphibians; CHAOYANGIA & Lissamphibia; Lissamphibia after Milner, 1994, Laurin & Reisz, 1997; 209 lec s02/20908s02.pdf; LissamphibPec; Systematics of the Amphibia; Biology 356; Evolución Spanish); Herpetology 101 - Suite101.com; Amphibians. ATW021017. Typhlonectes natans courtesy of Seth Morris and Rebecca Herndon of the Caecilians Web Site. Lissamphibia : (Urodela + Anura) + * : Eocaecilia + (Rhinatrematidae + Caeciliidae). Amphibian vertebrate "blind worms." Possibly sister group of urodeles. Strong, flattened, integrated skull; palate and lower jaw bear medial tooth rows; teeth generally recurved; tongue rather immobile and not protrusible; eyes covered, reduced or absent; $ protrusible tentacles between eyes and nares; $ tentacular fossa present near or within anterior margin of orbit; eye muscles exapted to manipulate tentacle; tentacle probably chemosensory as well as tactile; eye may be attached to tentacle and become protrusible (O'Reilly et al. (1996)); skull fully roofed; solid lateral wall of braincase (os basale) formed by fusion of otic capsule and parasphenoid; jaw articulation anterior to occiput; conspicuous dermal annuli (rings) around body; amphicoelous vertebrae hour-glass shaped, with longitudinal ventral keel; vertebrae with distinct anterior diapophysis and parapophysis; short, 2-headed ribs present on almost all vertebrae; $ dermal scales around annuli; tail much reduced or absent; internal concertina locomotion, moving internally over own annuli in many terrestrial forms; regular molts of microsquamose covering in some forms; but skin also glandular and may produce potent toxins in mucous secretions; limbless; lack bone marrow (? ); fossorial (damp soils) or aquatic; terrestrial forms may be powerful diggers; feed on worms, insects, perhaps vegetation (?! ); may have aquatic larval stage; larvae (or embryos) have conspicuous external gills; lateral line present in some larvae; water may be absorbed through skin; lungless species known. Jared et al. (1999); O'Reilly et al. 1996); O'Reilly et al. (1997); Summers & O'Reilly (1997); Wilkinson & Nussbaum 1997). 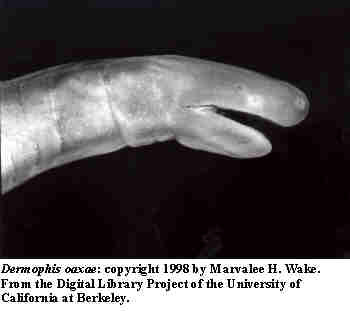 Eocaecilia: E. micropodia Jenkins & Walsh 1993. Gymnophiona : (Rhinatrematidae + Caeciliidae) + *. Mouth slightly subterminal; 2 upper rows of teeth, palatine-vomeral and maxillary; lower jaw from pseudodentary & pseudoangular; large "retroarticular process" on lower jaw; internal process on pseudoangular; maxilla & palatine separate; tentacular foramen present along anterior orbit; orbit large; complete primitive set of circumorbital bones: prefrontal, lacrimal, jugal, postorbital & postfrontal; quadratojugal present (but not figured? ); $ stapes large, with anterior foramen, expanded at both ends, contacting braincase (antero-medially) and os basale (postero-medially? ); stapes articulates at joint (?) with retroarticular process; exoccipitals, parasphenoid & otic capsules fused (os basale); paired occipital condyles? ; glenoid tubercle on 1st cervical similar to microsaurs & salamanders); intercentra present; short 2-headed ribs on all vertebrae except caudals; limb remnants. Notes: Most of these characteristics are diagnostic of Gymnophiona. The complete set of circum-orbital bones, the quadratojugal and especially) separate palatines mark this as a more plesiomorphic form. Jenkins & Walsh argue that these characteristics are further evidence of lissamphibian monophyly. ATW030328. Gymnophiona :: Caeciliidae + *. Characters: small (<32 cm); skull zygokrotaphic; mouth terminal (other families are ventral); tentacle adjacent to orbit; prefrontal fused with palato-maxilla; true tail with caudal vertebrae, caudal muscles & dermal annuli; terrestrial, with aquatic larvae. Caeciliidae: = Caeciliaidae? Boulengerula, Brasilotyphlus, Caecilia, Dermophis, Gegeneophis, Gegenophis, Geotrypetes, Grandisonia, Gymnophis, Herpele, Hypogeophis, Idiocranium, Indotyphlus, Leutkenotyphlus, Microcaecilia, Mimosiphonops, Oscaecilia, Parvicaecilia, Praslinia, Schistometopum, Siphonops, Sylvacaecilia. Probably paraphyletic, and including Typhlonectidae. Gymnophiona :: Rhinatrematidae + *. Stegokrotaphic skull; mouth subterminal; tail absent; terrestrial (mostly burrowers) and aquatic; some viviparous; no aquatic larva but see Taxonomy). Note: Some with very odd reproductive patterns. ATW021119. Lissamphibia :: Anura + * : Karaurus + Sirenidae. main skull support is braincase; as in frogs, otic capsule attaches to jugal (? ); maxilla separated from squamosal & quadrate by long gap; primitively, squamosal, quadrate & pterygoid form suspensorium similar to teleosts; hyoid apparatus protrudes tongue (muscles on ceratohyal pull forward and thrust anterior hyoid, with tongue, out of mouth); loss of post-orbital dermal bone permits expansion of mandibular adductor onto surface of braincase, especially prominent otic capsule; no otic notch, tympanum, or slender stapes; stapes structural link between braincase and cheek; body elongated; only extant tetrapod* group retaining horizontal septum dividing dorsal and ventral body wall muscles; ~equal limbs. protrusible tongue common; trade-off between protrusible tongue and buccal pump (thus some species. with protrusible tongue lack lungs). Locomotion involves fish-like lateral bending with limb movements. Pedomorphosis common with retention of external gills, larval tooth & bone patterns, lateral line system. Several convergent species. adapted to caves with loss of eyes. Largest genome of any tetrapod, largely repetitive DNA. Links: Index of ... URODELES/; Ensatina; Batrachosauroididae ...from the late Cretaceous; JEB -- Summaries: Reilly 199 (5): 1219. 010719. Karaurus: K. sharovi Ivachnenko 1978. Range: Late Jurassic of Kazakhstan. Urodela : Sirenidae + *. Links: karaurus; Transitions among amphibians; Biology 356. ATW030202. Range: from the Late Cretaceous of North America only. Urodela :: Karaurus + *. Characters: Premaxillae separated, paired; premaxillae with long posterior processes extending lateral to nasals; septomaxillae absent; maxillae small; nasals ossify from single, medially-positioned anlage; lacrimals absent; small eyes; eyelids absent; quadratojugal absent; exoccipital not involved in origin of m. levator mandibulae anterior superficialis (origin on lateral skull); pterygoids small; columella present, detached; otic operculum absent; basilaris complex is present in inner ear; recessus amphibiorum oriented horizontally; otic sac [?] bulbar & partially vascularized; amphibian periotic canal lacks fibrous connective tissue; periotic cistern large, protrudes into fenestra [what fenestra? ]; parasphenoids lack foramina for internal carotid; angular fused with dentary; teeth lack distinct crown and pedicel; replacement of vomerine teeth proceeds laterally in parallel to the maxillary teeth; large external gills; one pair (Pseudobranchus) or three pairs (Siren) of gill slits; first hypobranchial & first ceratobranchial separate; second ceratobranchial includes four elements; lungs present; body long, slender & eel-like; vertebral centra amphicoelous; ribs are bicapitate; spinal-nerve foramina present in neural arches except those exiting between atlas & first trunk vertebra; finlike tail; forelimbs small; scapula & coracoid not fused; digits 4/0; $ hind limbs absent; pelvic girdle absent; mm pubotibialis & puboischiotibialis present & separate; dermal glands for moisture seal during daily torpor or estivation; kidney, anterior glomeruli well developed; ciliated epithelium absent from cloacal tube & anterior cloacal chamber of females; epidermal lining present in anterior cloacal chamber of females; evaginations absent from dorsolateral walls of male cloacal tube; anterior ventral glands absent from cloacae of females; Female cloacal chamber without spermathecae; glands secreting into the dorsal walls of the female cloaca absent; anterior ventral glands absent from male cloacae; posterior ventral glands absent from male cloacae; Kingsbury's glands absent from male cloacae; dorsal pelvic glands absent in males; lateral pelvic glands absent in males; glands secreting into the male cloacal orifice are absent; parental care of eggs is by females; omnivorous; do not metamorphose, retaining larval (aquatic) appearance; often nocturnal; inhabit shallow water in swamps, ditches and ponds, with muddy substrates and dense vegetation; assumed to be external fertilizers (cloacal glands absent). Note: believed to be living sister to all other living salamanders, but not particularly close relative. Anura: Frogs. 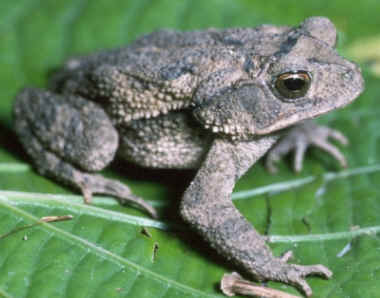 Defined as last common ancestor of living frogs and all its descendants. Lissamphibia :: Urodela + *.